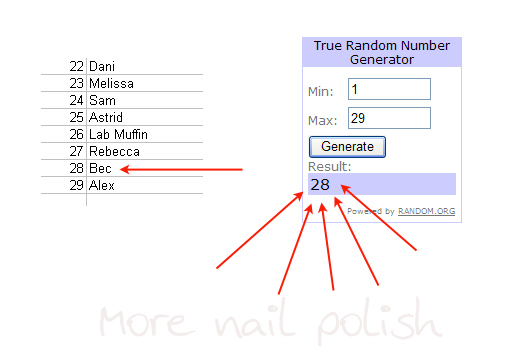 I'm starting with nails today, but if you want to skip down straight away to see the random winners, then I understand. Ok, are you back with me now? 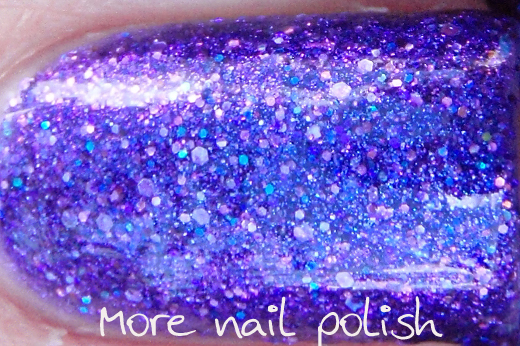 Here is a franken / custom polish called Fiber Optic which I created for Shatter Me Claire's franken comp. If you haven't checked it out already, you should, cause there are some fantastic frankens over there, all with their ingredients listed out. 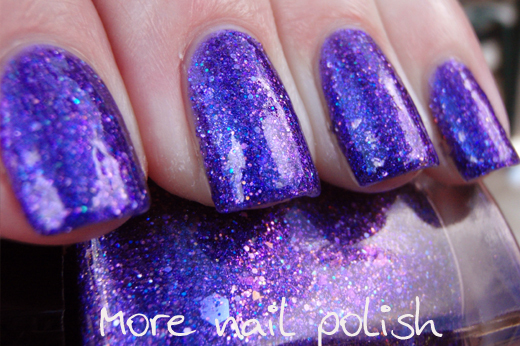 Plus you can vote for your favourite franken to win some Glitter Gal polishes. 1x scoop of Indu Rose Moondust (TKB Trading) - this is what gives it the blue/purple duochrome look. 5 drops of Ferric ferrocyanide tint - or use a dark blue polish. Untinted lacquer base (suspension base). 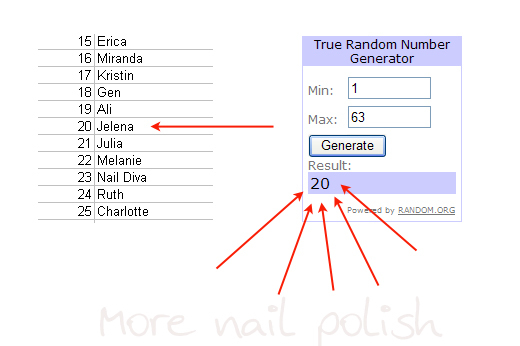 Ok, now the random winners of the Nail Art Challenge. First up - the Aussies. There were only 29 in the draw cause the overall winner (Ev) was removed from the random drawer after emailing me this morning. Congratulations Bec! Please email me within 24 hours, or I'm going to randomly select another Aussie winner. Congratulations Jelena! Please email me within 24 hours, or I'm going to randomly select another international winner. Once again thank you to all the ladies (and gentlemen) that made the effort to enter, and of course thank you also to the amazing Lynnderella for making the amazing polishes which made the whole nail art challenge so huge for me! and yes, your franken is fabolous!!! Your franken is so gorgeous! 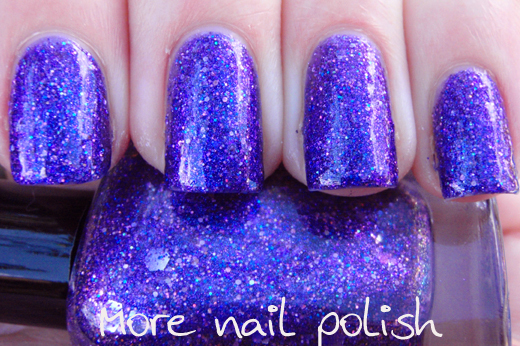 That is a brilliant purple, and it's really filled wth a variety of glitter. Your Franken is a beautiful color and very unique! Good luck! I get Lynnderellas?? OMGOMGOMGOMGOMG!!!! Thanks so much Cathy! And congrats to Jelena too! Ohhhh... I absolutely love your franken! My pocketbook is crying, considering adding the ingredients to all the polishes I was already planning on buying in the next month or so. I was waiting to see more pics of your franken, loveeee it! Congratulations to the winners! :) Your franken is gorgeous! 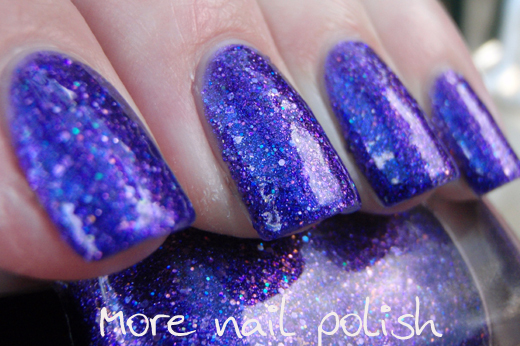 If I ever order from TBK I'll be buying those pigments just so I can make this! Congratulations again to the winners throughout the competition. Actually ... you're all winners with your creativity! Very pretty franken too thanks for sharing the recipe.